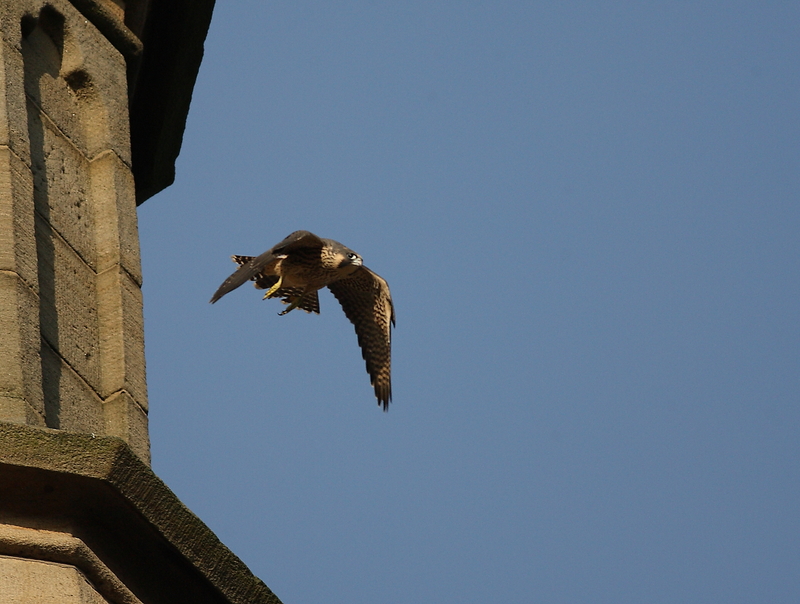 SBSG Chairman David Wood answers some of the common queries we receive about Peregrines. Why are they called Peregrines? The Latin name for Peregrine, Falco peregrinus,dates from 1771 and a specimen taken in Northamptonshire: it’s a member of the falcon family, and is found widely around the world, living on all continents except Antarctica. Peregrinus means ‘wanderer’: populations at northern latitudes do migrate, but birds that breed in more temperate zones are largely sedentary. British birds move only short distances (c.25 miles on average) to leave upland sites in winter. Voous (1961) recorded a Peregrine landing on a ship 800 miles W of Africa and departing 700 miles E of South America. Names across Europe, where the species was often a migrant, give an idea of the shared vision of the bird: Pelgrim (Dutch) Wanderfalk (Germany), Passager (France) and Pilgrimsfalk (Sweden). The English name Peregrine has been in use since around the 16th century. Before then, they were called falcons, but this came to be used for the female, while the male became known as the tiercel (or tercel) as it smaller by about a third. How many Peregrines are there? There are 17 races (subspecies) of Peregrine worldwide, with races found further north (and south) larger on the whole and those in hotter climates tending to be smaller. A national survey conducted by the BTO in 2002 found 1,437 pairs in the UK and Isle of Man. This is the highest population level on record, but there is a recent decline in areas of Scotland, and on grouse moors across northern England breeding productivity is 50% lower than in other habitats. 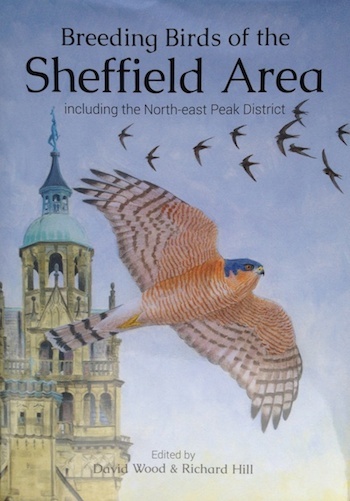 The SBSG Breeding Atlas (2003-08) gives a detailed account of the fortunes of Peregrines in the Sheffield area and recorded 11 pairs confirmed to breed in the 1200km2 of the Group’s recording area, following the first local breeding success in 1984. It is estimated that there are 12,000-25,000 pairs in Europe, with Britain holding the biggest national population after Spain and Turkey. Historical documentation of Peregrines in Britain dates from the 8th century and excavations of 9th century Viking settlements in Orkney revealed Peregrine bones. Where do they breed and why are they nesting in Sheffield? A pair was noted to breed at Salisbury cathedral in the 1860s but in general urban breeding is a relatively recent phenomenon. At the end of the 1970s, Newton (1979) stated that ‘it has nested in only a few modern cities’, the habit of breeding on tall buildings in cities having arisen independently on 4 continents (Europe, N America, Australasia and Africa); Newton suggests that ‘cities are acceptable only to a small fraction of the Peregrine population, mass human presence deterring the rest.’ Peregrines’ preferred nest site is cliffs and crags, which tall buildings replicate. They do, however, also nest in cavities in large trees, in old nests of other tree-nesting species and even breed on the ground on islets surrounded by water or bog in the far north of their range. Ratcliffe (1980) estimated that the moors and edges between Manchester and Sheffield could hold at least 11 pairs, though persecution by game interests had rendered the species extinct in the Peak District before 1900. Occasional breeding attempts in the early-mid twentieth century failed through persecution and Ratcliffe felt that ‘the prospects for the species ever becoming firmly established in the Peak are this pretty slender’. Distances between breeding pairs depend on availability of nest sites and food. Competition for nest sites can be intense between males, with fatal attacks noted occasionally. Ian Newton’s Population Ecology of Raptors cites mean distances of 2.6 km on sea cliffs with numerous seabird colonies; 4.8 km over much of England, Wales and S Scotland; 10.3 km in W and NW Highlands of Scotland. Territorial area for a pair varied from 52 km square (S England with rich farmland) to 220 km square in W Highlands. In W Canada there is as little as 1.6 km between pairs, with sea cliffs and massive populations of nesting seabirds. 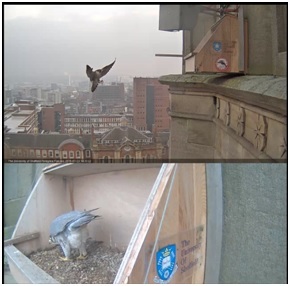 The provision of nest platforms in urban environments and ongoing illegal persecution around grouse moors means that there are now probably more successful pairs of Peregrines in the Sheffield, Rotherham and surrounding urban areas than in the whole of the Pennines from Ladybower to Northumberland. Some 60-70% of birds do not survive their first year, with mortality of 20-30% in later years. About half are thought to die from infectious disease, parasitism or other organic diseases. Known causes of death include trichomoniasis (better known for killing large numbers of Greenfinches and other finches), botulism and myiasis (fly maggot infestation). Those that make it beyond the first year may live for up to 11-15 years, though 6-8 would be more typical. The oldest recorded in the wild was 17. In a cliff nest (eyrie) foxes can predate broods and pine martens have also been recorded to do so. At an urban nest platform neither of these is a risk, though the St George’s pair have reacted very aggressively to Crows, Magpies and Lesser Black-backed Gulls, all of which could conceivably take the eggs (Crows have been recorded as predating Peregrine eggs). In continental Europe, Peregrine remains have been found among prey of Eagle Owls, but that won’t be a problem in Sheffield! There are several reports from Scottish islands of Peregrines being killed as a result of their feathers becoming clogged by Fulmar attacks, involving regurgitation of oils. 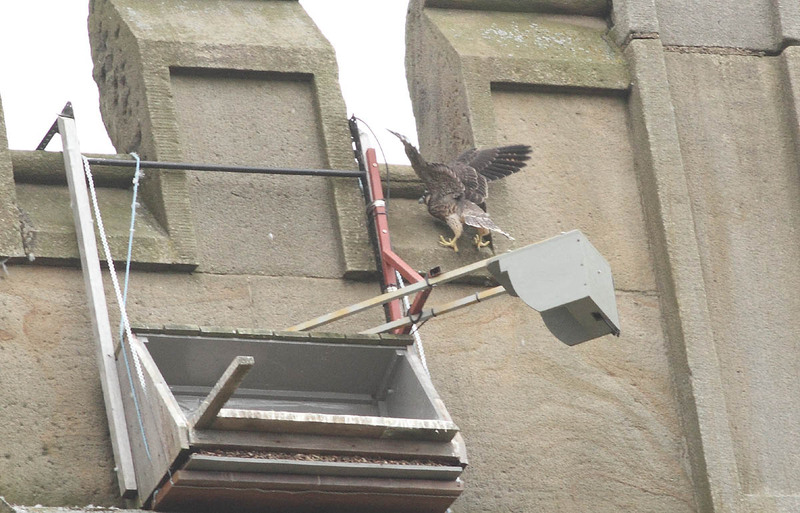 Despite these various natural predators, the only serious threat to Peregrines is man. An indication of historic persecution comes from records on a Scottish estate at Glengarry, where during the period 1837-40 98 Peregrines were killed, part of a total of 1,372 raptors killed. The serious persecution of Peregrines and other predators began in the 1700s as game shooting became fashionable and extensive land enclosures made falconry increasingly difficult. Gilbert White in 1767 recorded a Peregrine nailed to a barn after it had been shot as it fed on a Rook. During the Second World War the Secretary of State introduced the Destruction of Peregrine Falcons Order 1940, which remained in force until 1946 to protect carrier pigeons. This resulted in the shooting of almost 600 adults and immature, mostly on the south coast, with many eggs and eyasses also destroyed. The most serious threat to global Peregrine populations was the use of toxic chemical compounds (DDT) in herbicides from the 1950s. The concentration of the chemicals as they passed up the food chain resulted in lethal doses for raptors and egg shells thinned by some 20% in N England between 1947 and 1971, leading to catastrophically low breeding success. What protection do they enjoy? Peregrines enjoy special protection as a ‘Schedule 1’ species. For these rare and vulnerable species, it is also a criminal offense to ‘(a) disturb any wild bird included in Schedule 1 while it is building a nest or is in, on or near a nest containing eggs or young; or (b) disturb dependent young of such a bird.’ People who do so will be subject to special penalty under the law. How can you tell the male (tiercel) from the female? Females are noticeably larger than males, measuring as follows: wingspan 290-325 mm (male), 345-370 mm (female); length 400-450 mm (male), 450-500 mm (female), weight 600-800 g (male), 950-1,300 g (female). Females have relatively larger feet and larger talons than males. Plumage of the sexes is very similar, though females tend to be more heavily barred on the underparts. The extent and pattern of the dark hood varies from individual to individual and is one way in which the St George’s pair can be distinguished, along with the male’s ring on the right leg! Males may develop more quickly in the nest than females. How can you tell immature birds from adults? Immatures retain brown plumage on the upperparts for at least a year and up to 18 months as timing of the first moult varies considerably. The barring on the breast runs down rather than across, and they retain a buff-peach wash to the breast for some time after fledging. The base of the bill and eye-ring are powder blue in immature (bright yellow in adults). 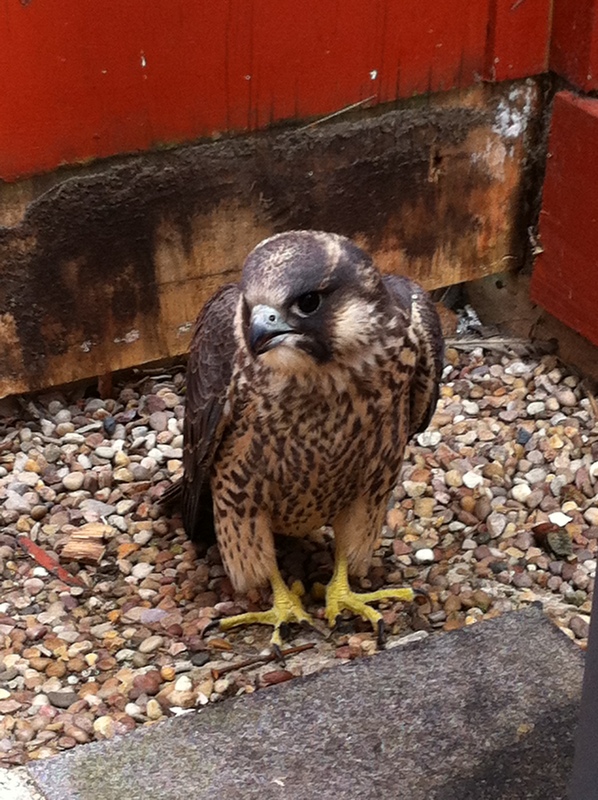 Peregrines have been known to breed in their second year while still in immature plumage. Three or four is typical: the average of 419 clutches was 3.65 (Ratcliffe). About 2% of clutches contain five eggs, and occasionally only two eggs are laid. Eggs are usually laid at intervals of around 48 hours, though there may be a longer gap to the last egg. An exceptional clutch of six eggs has been recorded very occasionally. Radcliffe (1980) gives 8 April as the average start date to the laying period, based on data first published in 1977. He does acknowledge that the date varies considerably according to geographical location, individual pairs and weather. He also notes that exact information on the date of first laying is ‘disappointingly small’, something that has changed markedly since urban nests covered by webcams. Females tend to lay the same number of eggs in successive years, with similar markings and colour, though a gradual reduction in the size of eggs in successive years has been noted. A clutch of 4 eggs weighs roughly 15% of an average adult female’s body weight. 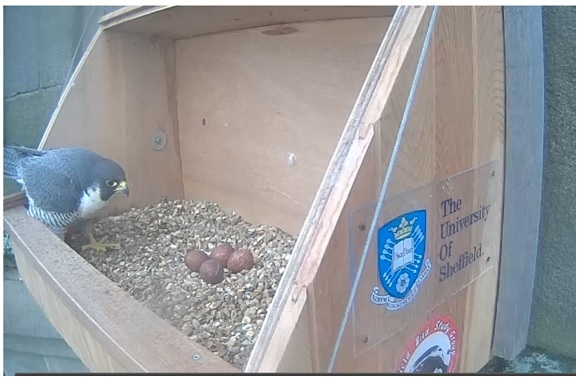 Very occasionally, Peregrines have been recorded to take over a clutch of Kestrel eggs when their own eggs have failed, one pair in Scotland rearing four Kestrels as their own brood. How long do the eggs take to hatch? The adults usually start to incubate the eggs more or less full time after the second or third is laid. From then it takes 30-32 days for them to hatch. The eggs tend to hatch in quite well synchronised fashion, the result of incubation only getting under way once three (or four) eggs have been laid. They usually all hatch within 48 hours, which is taken to mean that food supply is secure and that chicks that hatch stand a good chance of growing to fledging. The synchronised hatching also results in little conflict between siblings in the nest. The female does most of the incubating, but the male also takes turns to allow the female to hunt and feed, though he will often provide food for her. The St George’s male has done more of the incubating that the literature suggests, doing roughly half of the duties. As females get older their breeding success declines, in terms of the number of eggs laid, the number of eggs to hatch, or both. How long do the chicks (eyases) stay in the nest? From hatching to leaving the nest (fledging) takes 5-6 weeks. During this time the chicks go from weighing about 60 grams (2 ounces) to weighing a little more than the adults (600-800 grams for adult male, 950-1300 grams for an adult female). The eyes of a newly born chick are closed for the first four days remain half open or see very poorly. After about a week they begin to preen and stretch their wings and legs. By this time they can also successfully eject their faeces away from the nest. After about ten days they grow a second coat of down. Wing and tail quill feathers appear at around three weeks, when they start to flap their wings more vigorously and can stand more securely. By this time the adult will only rarely brood the young. 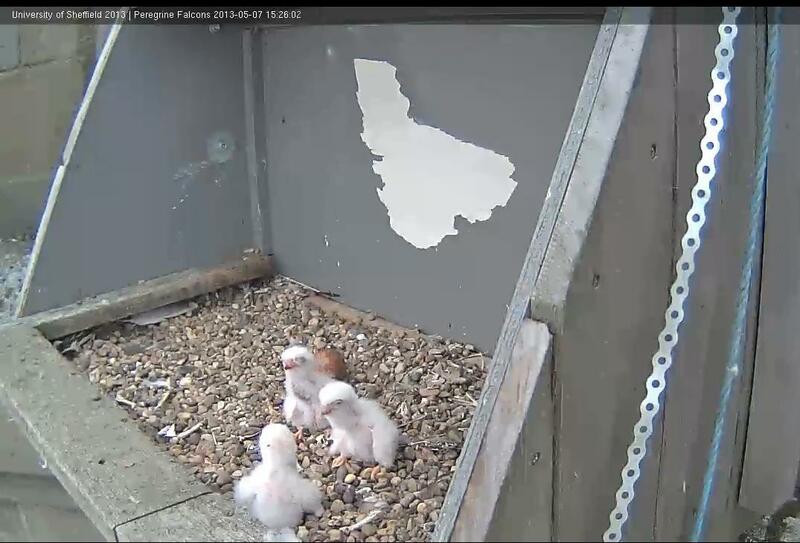 By the time the chicks are four weeks old they are starting to show more juvenile plumage and spend increasing amounts of time wing-flapping, which helps them to lose the remaining down. On average, chicks take their first flight 78 days after the laying of the first egg. Where do they go after they leave the nest? The young will stay in the vicinity of the nest for several weeks, gradually roaming more widely. British Peregrines do not routinely migrate beyond these shores, though they do undertake regional migration from upland breeding areas in winter when food supply is scarce. Ringing recoveries indicate that most young Peregrines will disperse less than 60 miles from the nest where they hatched, and ringing records also confirm that some Scandinavian Peregrines reach Britain. 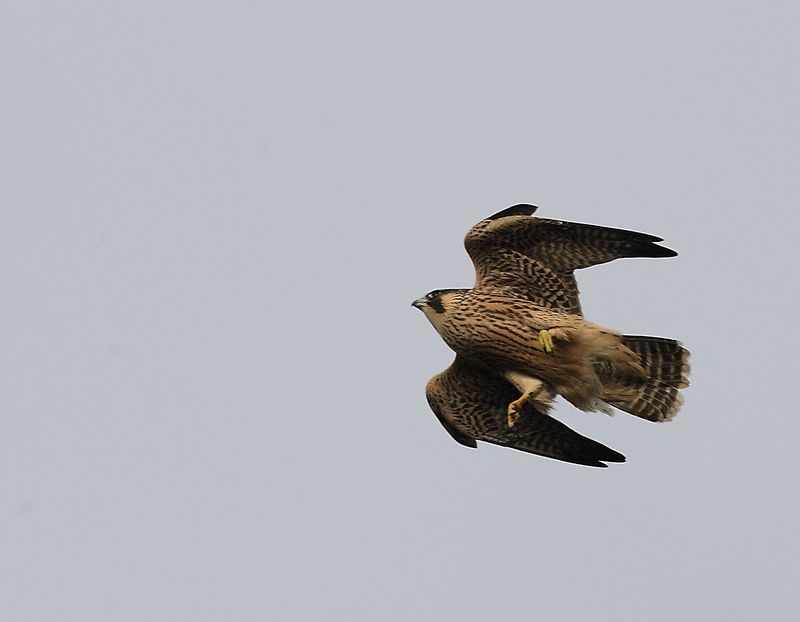 In level flight Peregrines fly at up to 60 mph, but in a dive they have been recorded at over 200 mph! They mostly feed on birds, but also take some mammals (especially rabbits and bats) and have been recorded feeding on frogs. A long-terms study of prey remains at a nest on Exeter cathedral found that 55 percent of prey by weight was Feral Pigeons. Observations in Sheffield would indicate that the percentage of the diet consisting of Feral Pigeons is considerably higher, perhaps around 75% by weight, which is in line with the national picture described by Ratcliffe. What are they at in the Peak District? Arrest them! Feckers! Do the eggs hatch in the same order as they were laid? 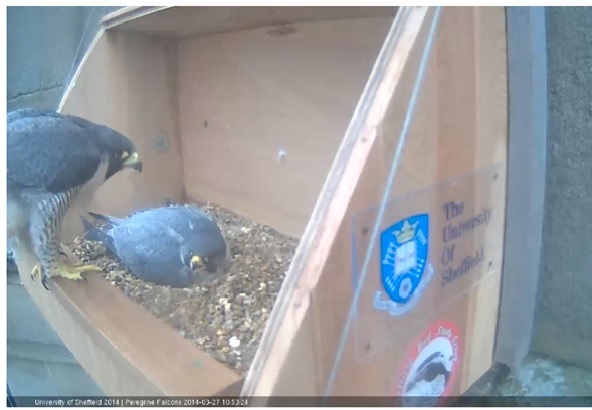 Hi is there any chance of moving the camera angle more to the left for the 2015 breeding season so we can see more of what they see when the look out rather than so much of the wall to the right? 🙂 Thanks! Absolutely marvellous, I’m hooked . Hi! Love the new perch cam! Just wondering: as this pair successfully fledged 4 chicks last year, might that encourage them to lay 5 eggs this year? They have increased their breeding success over the last three years. Given an adequate basic food supply (pigeons), I’m guessing this is mostly owing to their improving skills and team-work 🙂 But if they want to go further, they’ve got to lay more eggs, right? Saw female peregrine Guithwaite Common Lane, Upper Whiston, Rotherham, 1500hrs Sun 1st Nov.
where do the babies go after theyv’e fledged? if this is the same pair since 2012, they’re not coming back to where they were born! !